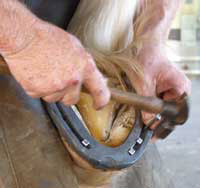 Competition Results 2010 have been sponsored by Jim Blurton Specialist Shoes, the leading supplier of bar shoes by a World Class farrier. 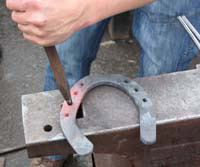 The London Cup Horseshoeing Competition is an annual competition between the Kings Troop Royal Horse Artillery and the Household Cavalry Mounted Regiment. 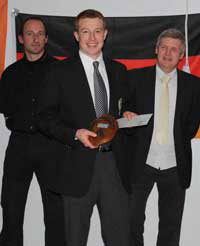 The London Cup competition first took place in 1990 when The London Cup was presented by the WCF for this competition. It has been run with barely a year missed with great success and this year was no exception. 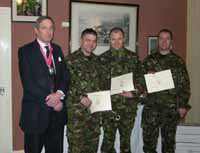 This year it was held on the 8th of December 2010 at the Kings Troop RHA in North West London with Mr Nigel Brown AWCF as the Judge. 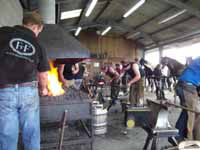 At 0700 the day began as normal, a cold but clear morning, with the Kings Troop farriers coming in to light the fires, check that the forge is still tidy and with everything that is needed for the day ahead. Shortly after, the Cavalry arrived - we were out of milk within the hour! (Think they must have a Jersey cow tethered up outside the forge at Knightsbridge to keep them in stock, at least it kept Gunners Greenslade and Gooding busy running to the shops to stock up). 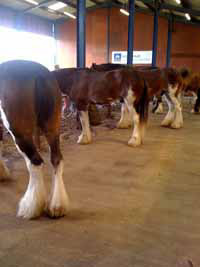 At 0750 2 Kings Troop Horses were brought in and tethered; No 48 Romulus and 94 Caesar - both of similar size and stamp to keep things as fair as possible. Both horses were labelled up and then we drew for which horse each team would have and this in turn would relate to the fire. The phone rang and it was the Guard room to inform me that the Nigel had arrived. Everyone was eager to see him but more importantly see the specimen, of which he had kept a secret, except for the fact that it was made from 12” of 1” x ½” (pre-cut). 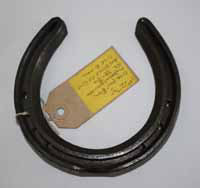 The specimen was a sweet little bevelled front with a masselot clip with some peculiarity to the outside heel. 0830 and the first round started. 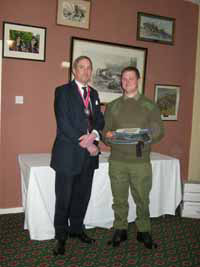 Time keeper for the day was Gnr Oliver Greenslade who is approximately 18 months into his apprenticeship. 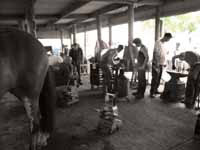 Competitors L/Bdr French (Kings Troop) and L/COH Tingley (HCMR) shod the near fore and made the specimen for which they had 70 minutes to do as they are apprentices (the qualified farriers were allowed 65 minutes). 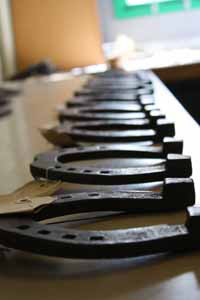 The horses were shod with ¾ Fullered shoes all round with a toe clip. 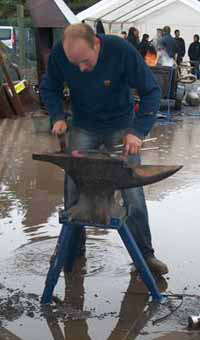 Half way through the morning Mr Jeremy Fern, the Master of The Worshipful Company of Farriers arrived. 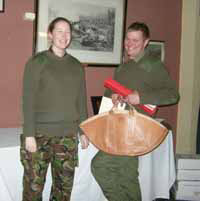 More coffee followed and an introduction to our Troop Captain (TC), Veronica Deakin who also hosted Jeremy for lunch. With 3 rounds complete, lots of blood (not horses!) sweat and nearly tears, it was time for a well deserved lunch. I was exhausted after all the hosting, talking, drinking coffee and the occasional transferral of scores onto the computer. The last round started at 1300 hours. Had both teams kept the best till last? Who knows…. 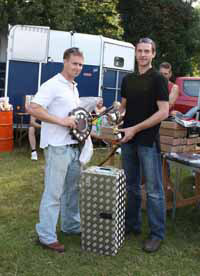 Bdr Matthew (Massive) Wallace and COH Chris (Taffy Boy) Thomas began with the hopes that they would be the best on the day, both having done well in past years. 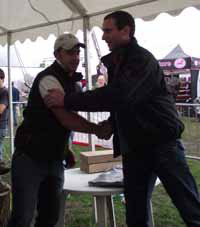 With the round finished both competitors shook hands with a competitive grin and scrutinised each other’s specimens to try and get an idea of who may have gained the most points. 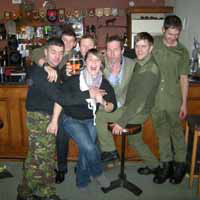 The fires were turned off, forge swept through, tools packed away, sweaty t-shirts off, uniform on and everyone went to the JNCO’s Mess Bar for a pint or 7 awaiting the prize giving. 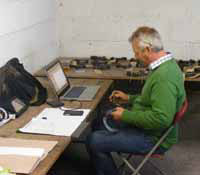 This left Nigel sorting through the specimen shoes, placing them in order and giving them all a mark. The results were added, typed and printed off by Nigel and myself ready to be announced and handed out. On reaching the Mess we got the important things done first which was a pint for me and a pint for Nigel. I called silence so that the Master, Mr J. Fern could say a few words. 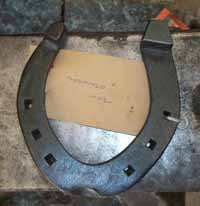 He was most impressed by what he viewed throughout the day and could not express enough how enjoyable it was to see the enthusiasm of our farriers creating the shoes from straight bar stock to the end results on the feet and of course the specimen shoes. 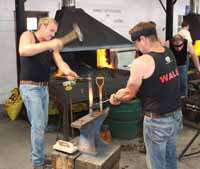 My good friend Nigel also spoke on the work through the day and it was my pleasure to present to him, with thanks from the King’s Troop Forge, a framed picture of the King’s Troop doing their famous “gallop out” at Royal Windsor Horse Show. 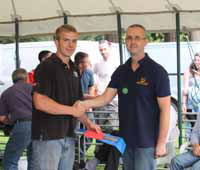 This is also when I had the pleasure in announcing that the King’s Troop RHA team had won with a score of 168.9 beating the HCMR with a score of 151.9 by 16.8! Special thanks go to – The Commanding Officer of the King’s Troop, Major N. Cross RHA, The Master WCF Mr Jeremy Fern for fitting us into his incredibly busy schedule at fairly short notice - we all really enjoyed your company and look forward to meeting you again in the future, Mr Nigel Brown AWCF for judging on this occasion, giving the time in the day to competitors explaining how their work had gone and for keeping us all company that evening in the bar until some silly hour drinking, the men of the King’s Troop Forge for their hard work leading up to the competition and all the efforts on the day to make it all run smoothly. 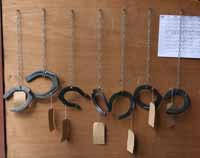 Individual marks and placings are available, please email Claire. Note: You will need to provide your team numbers so that i can identify you!! If you would like to know your individual results please email Claire. 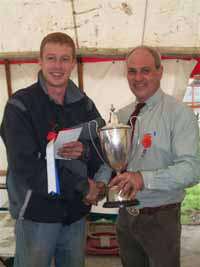 What a successful two day competition again this year well attended and great atmosphere within the team event….looking forward to next year….date for the diary the 22nd – 23rd October 2011.See you there!! Tremendous thanks to all the competitors and Dave Smith for judging and to everyone that helped to make the event run smoothly without every ones support it couldn’t happen. Finally on an educational footnote …apprentices due to take their Dip in the spring enjoyed following Dave who was judging and learnt from his coments. 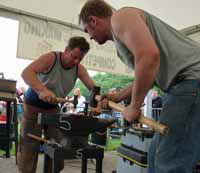 Our sponsors - Richard Ash Horseshoes, MNC Ltd, Handmade Shoes UK Ltd, Stromsholm Ltd, Swan Products, County Steel Supplies Ltd, F. Cooper & Son, Londonderry Forge Supplies. The competitors who stayed cheerful on a miserable day. 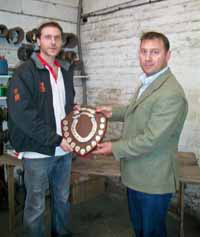 The George Broadhead Sheild awarded to the Open Class entrant with the best combined Open & Gas score was awarded to J. Atkinson. 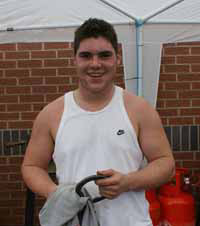 Many thanks to all who competed and gave generously to our Richard Ellis fund raiser which came to a total of £603.00 and has now been sent on to him . 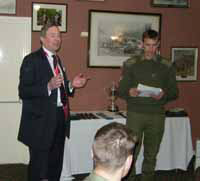 Thank you to Nigel Phillips for supplying the photo's. Massive thanks to all the competitors this year for there support. 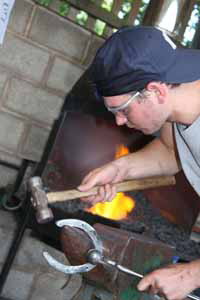 I would like to say a big thank you to Billy and Lucy Crothers at Handmade Shoes (UK) Ltd and Carl Bettison at Stromsholm for their generous sponsorship of the classes. 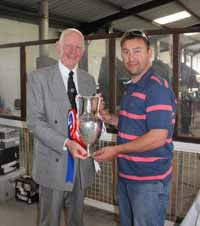 Congratulations to Stephen Hill AWCF winner of the Best Shod Horse at Burghley Horse Trials 2010. Alter Ego was ridden by Kate Walls and finished 50th overall. 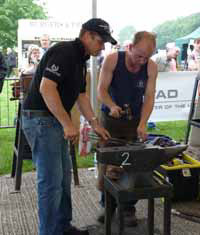 Peover Shoemaking Competition held on Sunday 15th of August at Cheshire Game and Angling Fair was another resounding success. 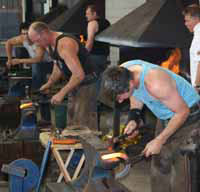 With Judge Jon Atkinson DipWCF setting challenging shoes throughout, especially in the Open class; the competition was fierce to claim the wonderful prizes supplied by our generous sponsors: Swan Forges, Handmade Shoes, J & M Randles, Londonderry Forge, B.L. 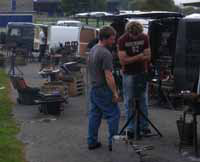 Farrier supplies, Derek Gardner, Stromsholm, Jim Blurton Tools, N & J Aluminium lining, Bob Marshall & NWT, Harris Gas, D.B. 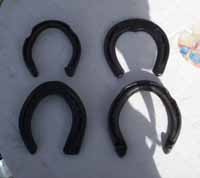 Crane Ltd, Cottams, A & J Ferrie, Breakaway Horseshoes and Steven Beane. Thank you to all competitors. We look forward to seeing you all again next year! Full marks are available, please email Claire. 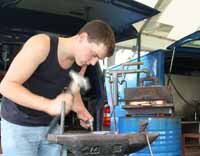 On the 14th of August 2010 Crossan Forge held its second Farrier Competition in Lisburn, Co. Antrim, at present it is still the ONLY Farrier competition held in Northern Ireland. 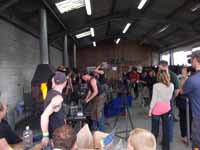 Growing in popularity from last year we had entrants from all over Ireland, Scotland and England who enjoyed the sunshine, atmosphere and lots of `craic`! Eagle Eye - Mr Dave Weberly. App Eagle Eye - Mr Lewis Balfour. 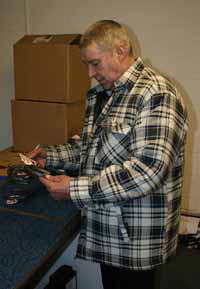 `Bump it up to Size`- Mr Steve McKay. 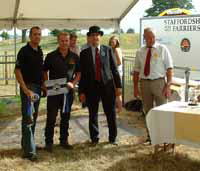 We would like to thank all the sponsors, the judge, the helpers and most of all the competitors who made it such a great day, we are looking forward to 2011 ! 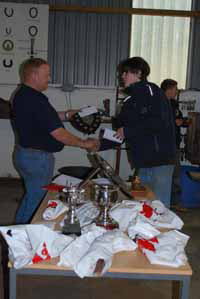 Full results and individual marks are available - please email Claire for your results. 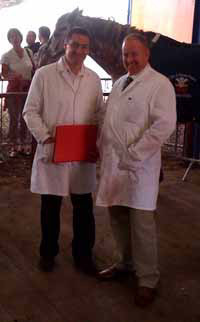 And many thanks to this years judge David Wilson. 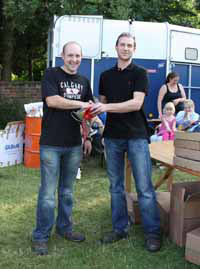 Thanks to Jonathon Nunn for providing the photo's! CALGARY – Beane there. Done that. Two years in a row. 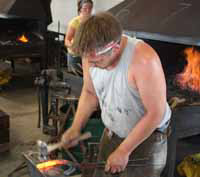 win his second consecutive World Championship Blacksmiths’ Competition title at the Calgary Stampede. 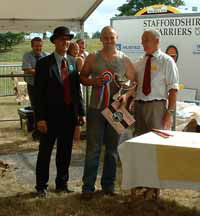 Beane, who hails from Northallerton, North Yorkshire, is the first back to back WCBC champion since Billy Crothers of Wales won the second and third of his five Stampede crowns back in 1995 and 1996. “It’s unbelievably hard to do that. Really, really hard,” said Beane, 31. “You’ve got so many good guys competing here . . . you’ve got to be on the top of your game, and I’m lucky I was on top of my game today. Beane fired up a performance Sunday during the 31st annual WCBC that couldn’t be matched by any of his competitors. During the 10-man semifinal, he opened up a 21-point lead on Jake Engler of Magnolia, Texas, and in the final, he increased that advantage, prevailing by 32 points over Engler. Beane finished with 147 points to Engler’s 115. 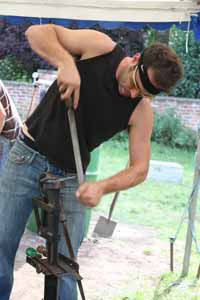 As for the other finalists, Scotland’s Derek Gardner was third with 115 (Engler won a tiebreaker on the fit of a horse’s shoe), fellow Scot David Varini was fourth with 94, and Texan Gene Lieser ended up fifth with 87. 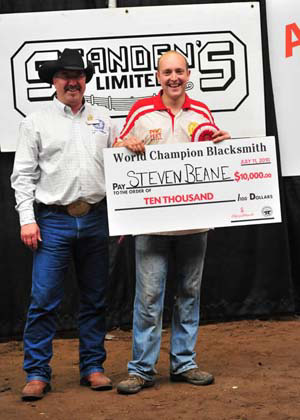 Beane wins a cheque for $10,000, as well as a gold-and-silver Stampede championship buckle, a limited edition bronze trophy, and a champion’s jacket. 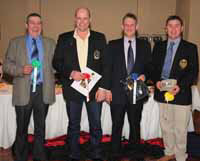 More than $50,000 in cash and prizes were handed out to WCBC competitors this weekend. 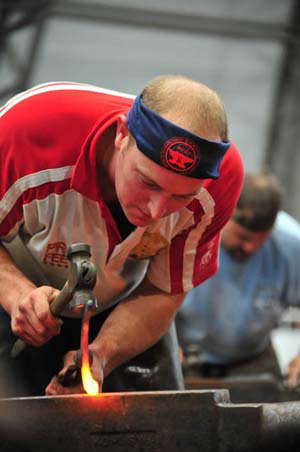 The WCBC, known popularly as the “Olympics of blacksmithing,” attracted 58 competitors this year from 12 countries: England, Germany, New Zealand, Scotland, Hungary, Australia, Ireland, Sweden, Norway, South Africa, the United States and Canada. 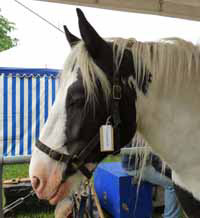 Sunday morning’s semifinal saw the 10 remaining contestants shoe both front feet of a light draft horse in 60 minutes. 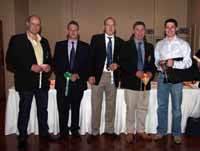 Scotland’s Ian Gajczak, Americans Chris Madrid, Jim Quick, and Tim McPhee, and Colain Duret of Turner Valley, Alta., were eliminated as the field was narrowed to five. 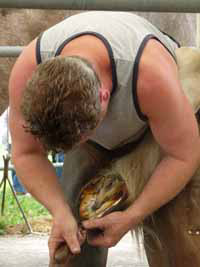 The finalists were given another 60 minutes to shoe both hind feet of that same horse. 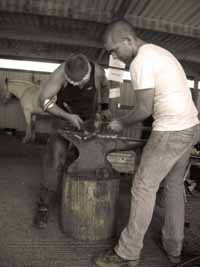 Judges Craig Trnka of the U.S., a Stampede champ in 1999, and Andrew Reader-Smith of New Zealand, a WCBC finalist last year, based their decisions, through a blind judging process, on shoe forging, finish, and nail placement, as well as preparation and balance of the horses’ feet. 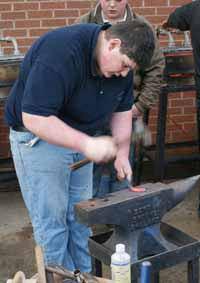 Grant Moon was named Forging Champion this weekend, while Beane earned Shoeing Champion honours. 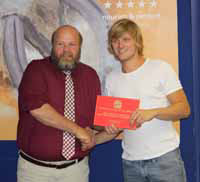 The Artistic Champion nod went to Australia’s Dean Lewis, while Jonathon Nunn of the United Kingdom was named Rookie of the Year. 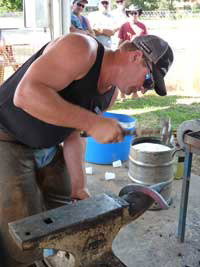 Blaine Virostek, who chairs the Stampede’s Blacksmith committee, was pleased with what he saw at this year’s 31st annual WCBC, which remains the blacksmith industry’s premier competition. 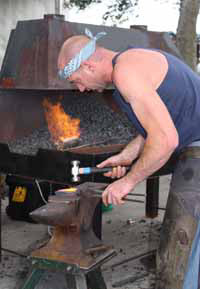 Saturday night during the Metal Art Auction and Metal Art Showcase, an increasingly popular offshoot of the WCBC, Lewis swept up at the trophy table. 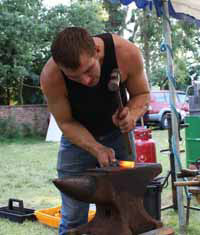 Lewis won the pot luck artistic forging category with fellow Aussie Fred Savage, and was also named winner in the artistic forging and artistic metal non-forged categories. 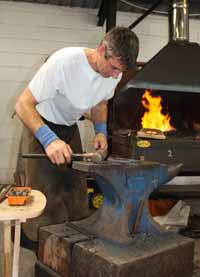 The seventh annual Metal Art Auction raised $13,000, with 60 per cent of proceeds going back to the artists. 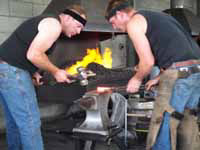 Full results are available on the Forge Magazine website. Full photo gallery can be seen by clicking here. 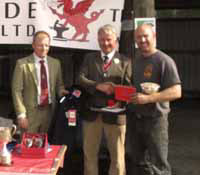 Congratulations to David Mathews, farrier to Red Admiral, owned by Colin Benford, winner of the Best Shod Horse and a Worshipful Company of Farriers' Plaque at Warfield Driving Show. The organisers would like to thank all of the class sponsors for their kind donation of prizes, the competitors who make the weekend work and to Richard Ellis for his hard work judging the competition. 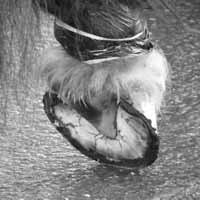 This competition will be moved to the last weekend in May next year and will feature an early preview of the specimen shoes for the Royal Highland Show - one not to be missed! 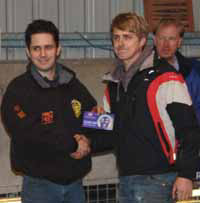 Many thanks to Donald Nicol for providing the results and images. 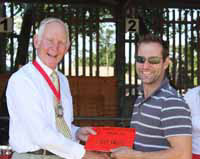 Congratulations to Michael Handley, winner of the Best Shod Horse and a Worshipful Company of Farriers' Plaque in the Single Horse Class at Sandringham. 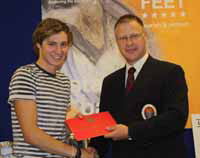 Congratulations to Peter Brulisauer and Philipp Buhler winners of WCF Silver Medals! 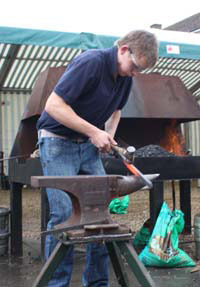 On what was probably the hottest day of the year we held our first shoemaking competition at our premises in Sandling, Maidstone. 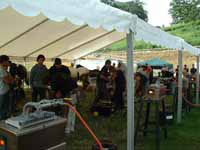 We had a high attendance of competitors and a big thank you goes to them for making it such a successful and special day. 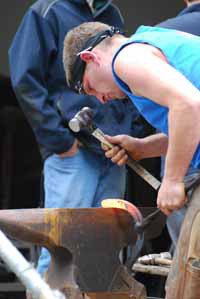 Braving the weather heat upon heat of the sun and forges the competition commenced with the First/Second Years rounds. Big thank you to Martin, Emily, Robert & Ben Nuttall, Hazel, Amy & Grace Milton, Alice & Beth Bentley for all their help in cooking, clearing and running all day. 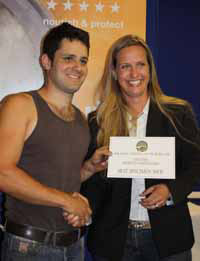 Well done everybody and we look forward to seeing everyone for our second competition in June 2011 – bigger and better! 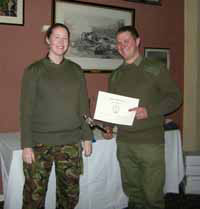 With grateful thanks to Tracey for providing the photo's. With special thanks to Alan Murdoch for supplying the images! 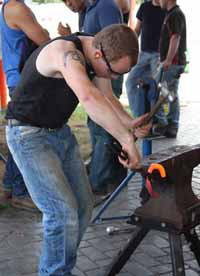 The 126th Lincolnshire show Farriery competition was held the Wednesday and Thursday of the 23th & 24th of June. 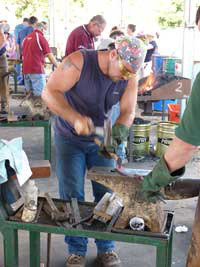 Competitor numbers were up again this year and the competition ran very smoothly. 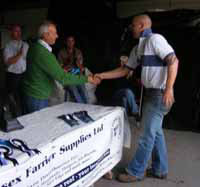 A very big thank you to the sponsors, Farriers Choice, Arthur Cottham and Farriers Formula. Without such great sponsors these competitions could not take place. 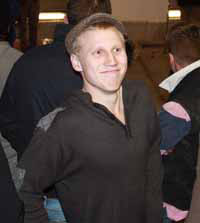 A big thank you also goes out to Ben Smith DWCF for supplying horses’ last minute for the Hunter class. 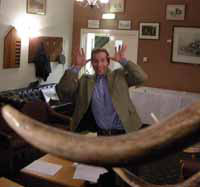 This year’s Judge was Mark Caldwell FWCF who supplied competitors with very well made traditional specimen shoes. 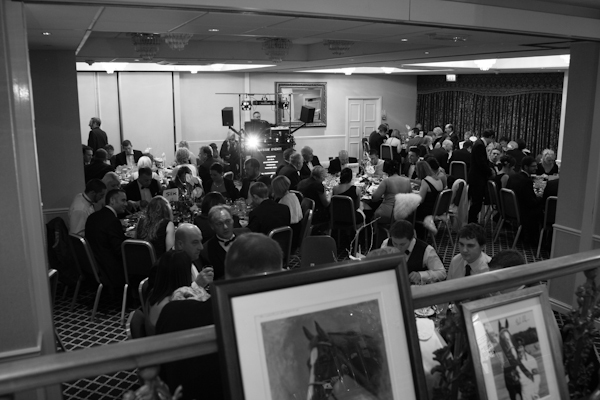 A special big thank you once again to the chief steward Adrian Middleton and stewards Andy Welch and Alex Mercer for overseeing the smooth running of the competition. Lastly a massive thank you to the competitors which turned up, for your time and the high standard of work you produced. Hope to see more of you next year. 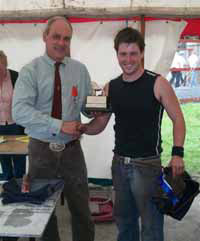 Congratulations to Duncan Thomson, farrier to Brookeborough Duke owned by J Hollister and A Hamilton Jones, winner of the Best Shod Horse and a Worshipful Company of Farriers' Plaque at the BDS Annual Show. 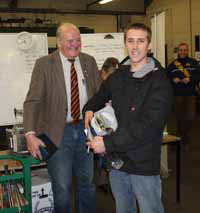 Apprentice Prize - J C Lee. 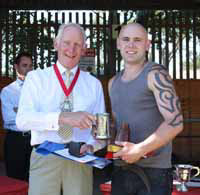 Arthur Watts Cup :- ( Best Dressed Foot ) Phillip Martin. 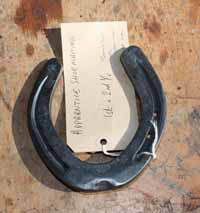 Deluxe Hoofpairer - Arthur Cottam (Best Dressed Foot) - Aksel Vibe. 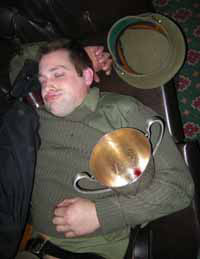 Box Of Rasps (Mustad) (Best Dressed Foot) - Derek Gardner. 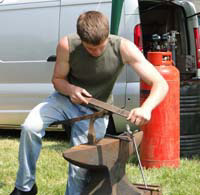 Four Forged Corner Test (£25.00 Prize Money). 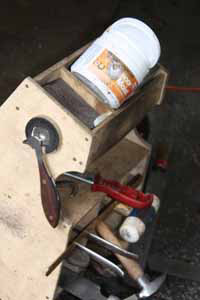 Box Legend Rasps ( Mustad ) (Best Dressed Foot) - Aksel Vibe. 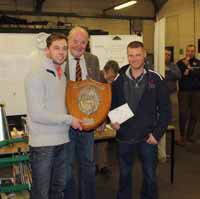 1st & 2nd Year Apprentice Shoemaking (Ellis Dawe & Derek Lloyd Challenge Trophy, WCF Bronze Medal). 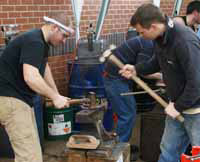 3 Pairs Of Tongs - J Blurton and Arthur Cottam Tankard for the Highest 1st Year Apprentice - Greg Calvert. 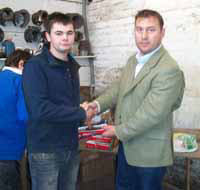 3 Pairs Of Tongs - J Blurton and Arthur Cottam Tankard for the Highest 2nd Year Apprentice - Ben Grange. 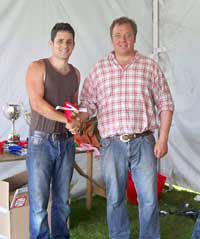 1st - J C Lee. 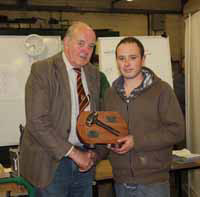 J Blurton Knife and Stromsholm Ltd Tankard for the Highest 3rd Year Apprentice - J C Lee. 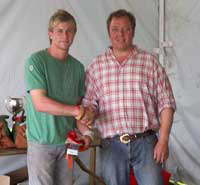 J Blurton Knife and Stromsholm Ltd Tankard for the Highest 4th Year Apprentice - Ryan Wadling. 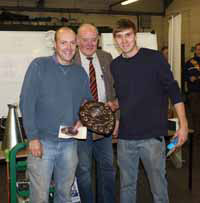 1st - Nigel Brown and Duncan Thomson. 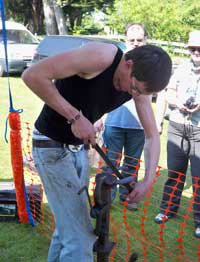 Speed Chain Making Competition (£100.00 Prize Money - Sponsored By Richard Ellis). 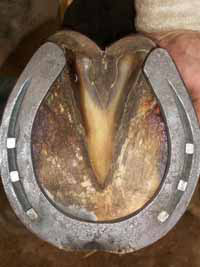 Best Shod Foot Of Competition - Londonderry Prize. 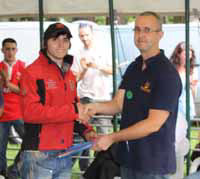 Banks Silver Trophy, WCF Silver Medal awarded To Competitor Gaining The Highest Aggregate Marks In Three Classes - Steven Beane. 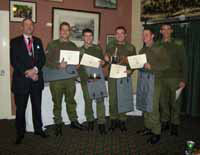 We Would Like To Say - Many Thanks To The Master Of The Worshipful Company Of Farriers For Presenting The Prizes. 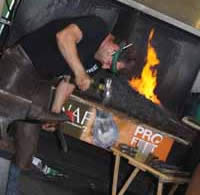 The Handmade Shoes (UK) Ltd South of England Show 2010 had record entries - three days of six fires continually in use with up to seven rounds a day caused the organisers Sarah Hayter, Tim Fieldwick (Chief Steward) & Chris Perrot (Time Keeper & Steward) some heart stopping moments! 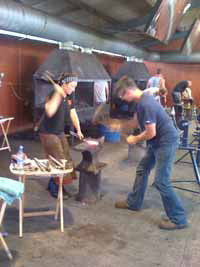 Prior to the competition some fires and fans were malfunctioning and anvils were missing but thanks to G.W Day, Jim Hayter, Steven Fisher and Chris Perrot by 7am on the first day it was all systems go. 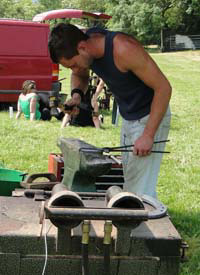 The competition ran in the heart of Sussex at one of the largest county shows, the South of England. 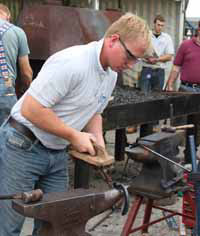 The first day began with the Open Shoemaking with judge, Gavin Golby, setting the task of asking competitors to make a deep seated bar shoe and a hind cob beval shoe. 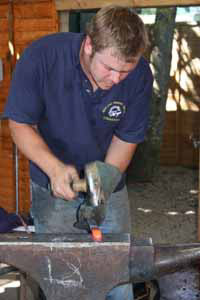 Marks were spread across the board, with the highest score being for the cob beval shoe gaining 9.1 by class winner Ben Casserly who finished on a total Open Shoemaking score of 17.0, winning a Handmade Shoes Vice and Stand, just ahead of Dave Smith who finished on a total score of 16.5. George Hutchins scored a superb 9.2 for his deep seated bar shoe, but unfortunately couldn’t keep up the standard for both shoes. 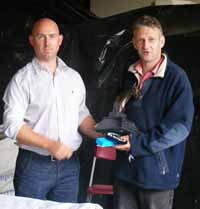 Thursday also saw the Open Pony Shoeing class being won by last year’s judge Jay Tovey, with Dave Smith in second place. 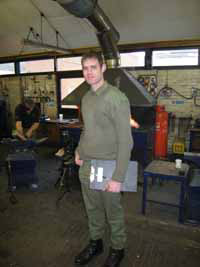 Third place went to Ricky Hilton - all receiving tools from Handmade Shoes Ltd. 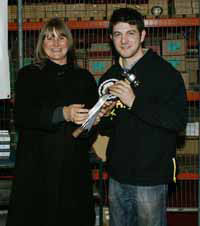 The William Hayter Perpetual trophy was awarded in an emotionally charged presentation by Mrs Jenny Hayter to her son James who was also awarded a beautiful pair of Roadster Cufflinks, very kindly donated by Anvil Jewellery / Handmade Shoes. 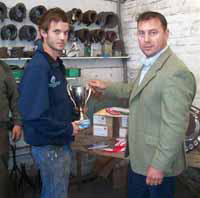 James has always wanted to win his late Father’s Cup for the Open Roadster class with the highest mark for fit - with a score of 8.9 - he finished on a total score of 42.4, just ahead of 3rd year apprentice Jack Casserly who is definitely one to watch for the future. 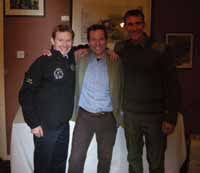 Jay Tovey finished the Open Hunter class with an impressive score of 44.1 just ahead of Andrew Casserly. 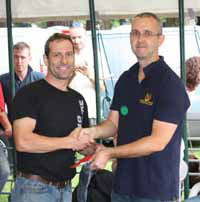 Nigel Fennell scored an impressive 9.1 for his nail and finish to clinch third place. 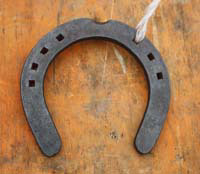 The 3rd & 4th Year class was won on equal marks between Jack Casserly and Dan Preece - both finishing on a score of 17.5 - with first place eventually being awarded to Jack who actually had the higher mark of 9.0 for his specimen shoe. 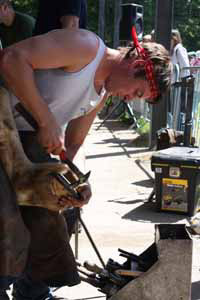 Apprentice James Elliot will have made his boss Billy Crothers proud of him after finishing just outside the placings in the Open Shoemaking and taking home a well deserved win in the 1st & 2nd Year class, closely followed by Jack Henty who is trained by ATF Jim Hayter. 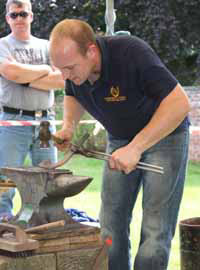 Gavin Golby told Open Competitors “he was very impressed with the high level of shoemaking and that he had been pleased with the trimming, nailing and finish he had been judging over the three days”. 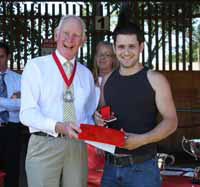 The prize giving was well attended with Wayne Upton AFCL from the Worshipful Company of Farriers presenting silver & bronze medals to those that had attained the very standard demanded by the Company. 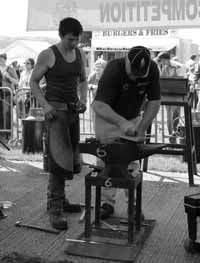 Once again the South of England Show would like to thank Handmade Shoes (UK) Ltd for their continual support of this competition - for which they have now been sole sponsor of for the last four years. 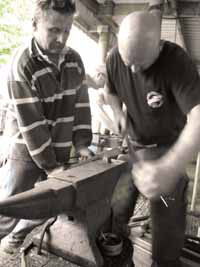 They very generously donated in excess of £3,000.00 worth of prizes to the 2010 competition and without companies such as Handmade Shoes it would be very hard to run these competitions. With thanks to Sarah Hayter for writing the report and Aaron Kampfer for supplying the images. The full image gallery can be viewed here. 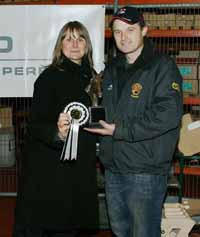 Congratulations to Simon Legge, winner of the Best Shod Horse in the Cob Class. 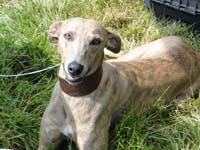 'Grigio Fumo' is owned by Karen Ledger in the Isle of Wight. Simon will receive a WCF Plaque. 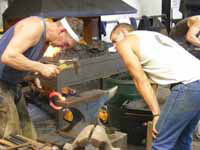 With temperatures soaring into the 80’s it was a survival of the fittest at this years Otley shoemaking competition. 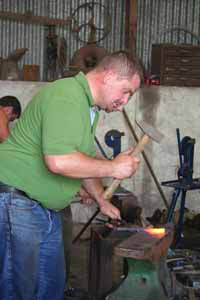 All the classes ran smoothly and on time thanks to chief steward Jon Hick so a massive thanks to him. Spud was kept busy judging over 300 shoes and our thanks go to him for doing a brilliant job .Our thanks for the continued support of our sponsors who were so very generous this year these include Handmade shoes, Londonderry Forge Supplies, Mustad, Arthur Cottam’s who this year in addition to prizes gave a trophy in memory of Arthur, to Vettec who sent 3 fantastic tool bag’s filled to the brim with Vettec goodies, Energas, County Steel and Swan Forges . We would really like to thank all the people who helped behind the scenes and made it another very successful year for the competition especially Cadfeal & Adam , roll on next year !. With grateful thanks to Emma Atkinson for providing the report and images. The Champions Event - preview article! 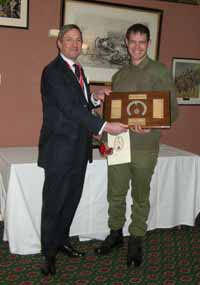 Finally the first competition of the year in Queensland has been run and won. 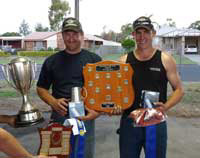 The Heavy Horse Field Day at Gatton was the venue for the 2010 World Cup. With competitor numbers up to 40 this year the standard was incredible. Two teams from New Zealand made the trip over and we must thank them generously for their support of this event. 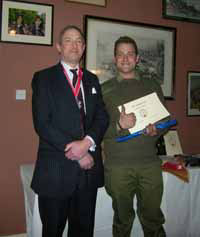 Col Smith from Melbourne was kind enough to give up his weekend to come and judge and we all thank him for his effort. While everyone else had a public holiday on the Monday, Victorians didn't have the same luxury so Col was up at 5am to get to the airport and back to Melbourne for a days work. Col stayed with my family during his stay in Queensland for the weekend which is the second time he has done so and I have been able to learn quite a lot about him. He has had a very wide travelled and wide ranging career so far and I will have to find the time to interview him in the near future, I'm sure his story will be interesting. 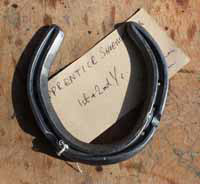 Col is another example of a farrier at the pointy end of the trade, they seem to have a clarity in their thinking when it comes to shoeing. He seems to be able to highlight things that were right infront of us all the time but we couldn't see. That is probably a vague statement but get into a conversation with Col and you will see what I mean. The Saturday started with the traditional judge's talk. 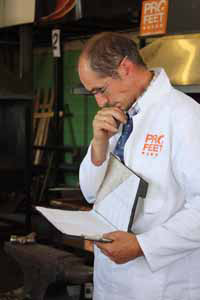 Col went through the blue prints telling us every element he wanted to see in the shoes. We were left in no doubt as to what was required from us and so there would be no excuses. This was driven home to me on the Saturday afternoon when I proudly called for the judge and handed him my shoe for his perusal. I had checked my level and nail holes and was pleased with my efforts. I decided it needed one more hemming run to clean up the edges and flaten it out a bit more, I was sure I was about to knock Col's socks off with my prowess. I quickly gave it a brush and cooled it out. 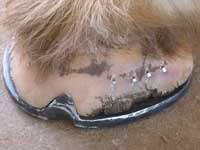 I realise now that you should ALWAYS check you nail fit as the last thing you do before you hand a shoe to a judge. I painfully learnt this as I watched Col put the nail into the first nail hole on the outside. At this point I was waiting for his impressed look but all I saw was his eyebrows hit his hairline when the nail only went half way in. I was going to ask for the shoe back but somehow I don't think this is allowed. I have written reports on quite a few comps in the past year and I seem to always find a stand out performance. 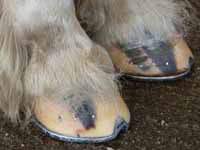 This may not mean the best shoe or best shoeing job, but just something that I noticed that everyone else probably didn't. This time I have to give it to a team rather than an individual. 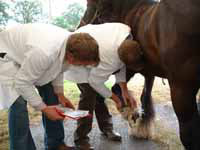 The Team of Luke Riding, Luke Klan and Bruce Donaldson had a very unco-operative horse on the Sunday morning. 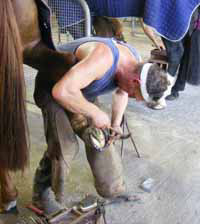 Despite the horse playing up like a second hand lawn mower they continued to try and get a good burn so their shoe would be set properly onto the foot. At no time were they flustered or asking for a time extension, they just got on with the job and made the best of it, even when the vet was about to give it a sedative they declined. 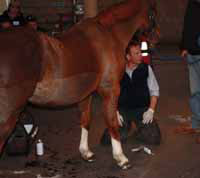 Myerscough College and staff for use of Facilities. 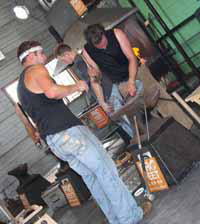 Judges: Grant Moon & Mark Caldwell. Cottams for their sponsorship once again. Everyone who kindly supplied horses at last minute. Stewards for their time and help. 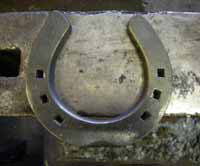 First and Second Year Apprentices to make two hind shoes. Time allowed 60 minutes. 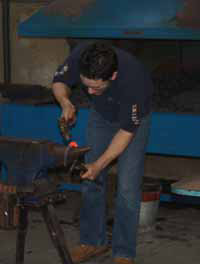 Third and Fourth Year Apprentices to make two front shoes. Time allowed 60 minutes. 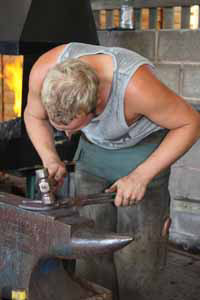 Heavy Horse Shoeing and Shoe Making. 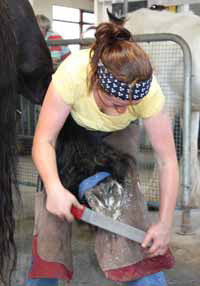 Open to registered farriers only. Time allowed 60minutes. 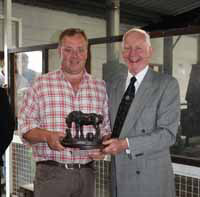 Worshipful Company of Farriers Plaque awarded to Maple Leaf Winstons Passion owned by A D Matthews and shod by Jim Cooper. 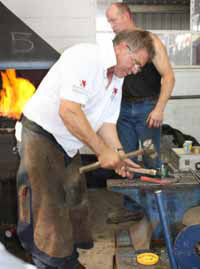 Worshipful Company of Farriers Silver Medal awarded to M D Smith. 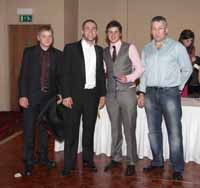 With grateful thanks to Hazel Ferrie for supplying the photo's, to view the full size images click here. 3rd - Wales (Masters: Matthew Rees, Rob Duggan, Elgan Harries, Gareth Thomas, C Williams (R), Aprentices: Anthony Williams, Harry Meek, Daniel Shinton, Tom Williams, N Tynon (R)). 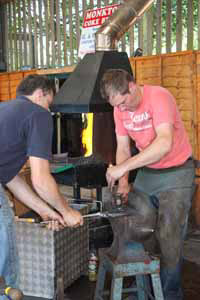 This year saw the first Middlewich shoemaking Competition, held at BL Farrier Supplies LTD and run by Leon Bentham and JC Lee. 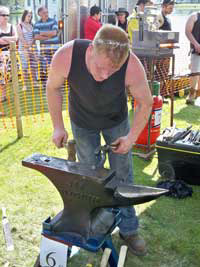 This competition was sponsored by over twenty-four local, national and international businesses, who together donated over two thousand pounds worth of steel, prizes and the running costs. 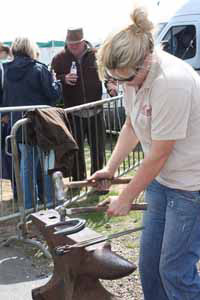 These sponsors included, BL Farrier Supplies LTD for the use of the yard and all the rosettes, Leggs Brothers for the concave steel, Staffordshire NAFBAE Branch for the loan of seven fires and anvils, Swan Products LTD for the loan of ten fires, Londonderry Forge Supplies, Jameg, Breakaway Horseshoes LTD, Handmade Horseshoes UK LTD, 3rd Millennium, J&A Ferrie, Alan Calvert Tools, MNC, Mustad, NWT Farrier Supplies, Ariat, Derek Gardner Tools and Alsager and Sandbach Saddlery all for very generous prizes, Ed Bentham & 1st Timperley Scouts for the food, Leon Bentham for the three trophies, Finn Carroll, Simon Bourne, Paul Brennan, Darren Slater and Chris Pailor all for cash towards the flat steel and gas and not forgetting Greenwood Photography LTD for the great snaps of the proceedings. 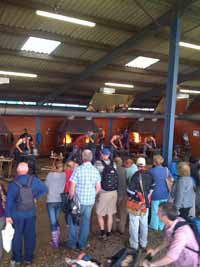 The publicity we were provided by forgeandfarrier.co.uk brought seventy-two competitors journeying many miles to take part and make this competition an excellent event. 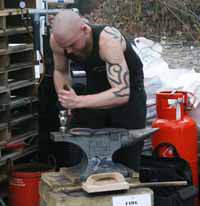 There were seventeen gas fires blazing all day so the competitors had no chance of getting cold on this frosty February day. 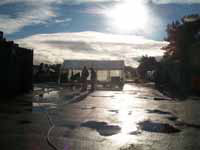 With the daylight hours on our minds and twenty-two rounds to get through there was a big worry of it going dark before we had finished the day’s work. 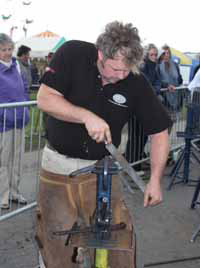 Local Farrier Terry Hargreaves kindly gave up his Sunday and rose up to the challenge as chief steward. 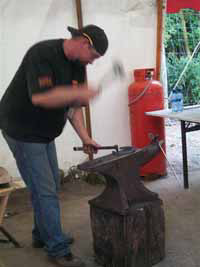 Terry, although not having been to a shoemaking competition in many years did a fabulous job keeping everyone in order and the day not only running to time but we were early at one point! The judges Alan Calvert and Gary Darlow had a tough job marking nearly four hundred shoes from the nine classes between them, but they did an excellent job. 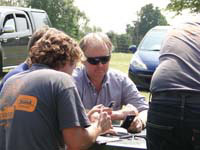 Our thanks would like to go to Russell Jones who checked all the marks for Alan in the 1st & 2nd year class, as Alan’s son was competing, so we could be sure of no bias. 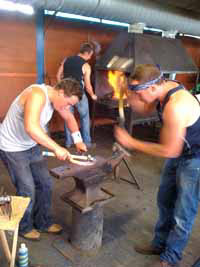 All through the day demonstrations were being held in the warehouse by Hew from Londonderry Forge Supplies and John from Equitech. 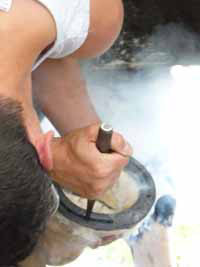 Lunch was provided by Ed Bentham who had the mammoth job of peeling potatoes for over one hundred and twenty portions of hot pot. For a further breakdown of result and marks visit the European Championships website. 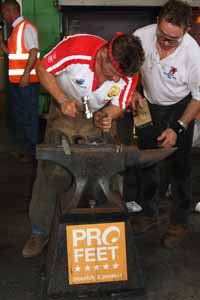 Special thanks to ProFeet, sposnors of the UK Farrier Team.